Three Barone Middle School track records were broken this year. “I am very proud of all of the hard work, throughout the season, and these results are a reflection of it,” said coach Marty Casey. At home, during the Meeker meet, Kelton Turner ran the 100-meter hurdles in 16.23 seconds for a new eighth grade boys’ record, previous record was 17.69. The seventh grade girls’ 100-meter dash record previously owned by Halle Ahrens fell to Emma Luce with a finish of 13.44 seconds at the Rangely meet. 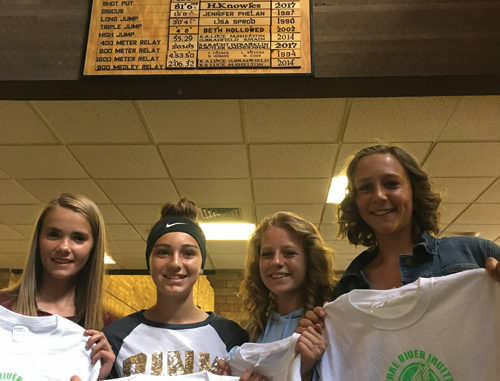 The seventh grade girls’ 4×200-meter relay record was broken at the Baggs, Wyo., meet with a time of 2 minutes 1.43 seconds by Autumn Hobbs, Jayden Overton-Linsacum, Madison Mendenhall, and Luce. The previous record was set in 2017 a time of 2:03.05.